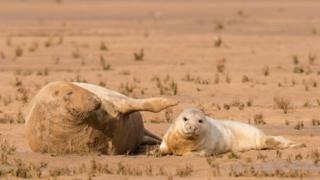 One of the UK's largest nature reserves has recorded its earliest ever seal pup birth. Lincolnshire Wildlife Trust, which runs the Donna Nook reserve, said the pup was born on Friday - beating last year's first birth by nine days. Rob Enderby, from the trust, described the birth as unusual because most pups are born in November and December. The early arrival could be due to the mother being well fed and healthy. Or "she was probably just ready," he said. A record-breaking 1,959 pups were born at the reserve in 2016, but the total is expected to rise slightly this season. Mr Enderby said it might be down to seals returning to the same place they were born to give birth themselves. He added the cow and her pup were vulnerable to disturbance and asked any potential visitors to stay behind the barriers. In 2011 and 2013, dozens of youngsters died when tidal surges hit the coast but the colony has otherwise enjoyed growth every year. The reserve, which is also used as an RAF bombing range, now attracts about 70,000 visitors annually. The seals spend most of the year at sea or on distant sandbanks but in November and December they come ashore to give birth. After suckling their pups for two to three weeks, the seals abandon the young, mate again ready for the following year and then head out to sea again. Eventually, starvation drives the young seals into the water in the hunt for food.